Turquoise is found in dry, barren regions where acidic, copper-rich groundwater trickles down and reacts with minerals that contain phosphorus and aluminum. Turquoise was first mined in the Sinai Desert 7,500 years ago, the mines in Persia and Iran dating back 5,200 years. Today it is mined in China, Egypt, Chile, Iran and the Southwestern U.S.A. The value of turquoise is determined by its color, texture and matrix (the dark ''veins'' throughout the stone). 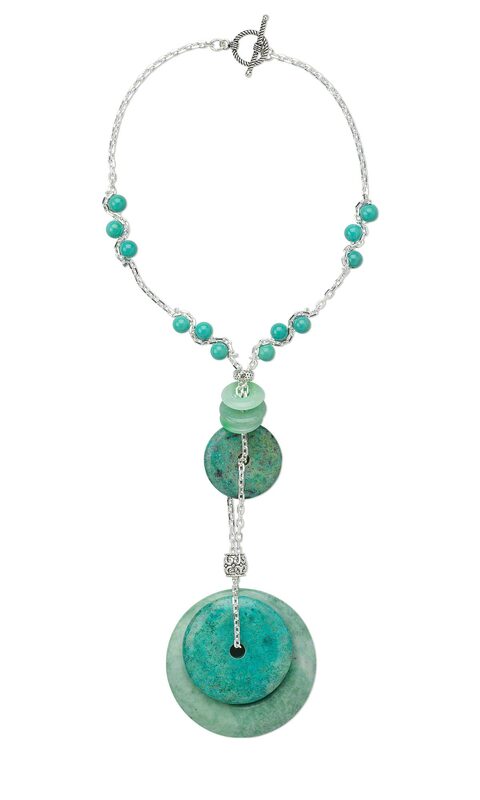 95 percent of turquoise on the market today is stabilized or enhanced. Natural Persian turquoise called ''robins-egg blue'' is the most valuable. Sleeping Beauty turquoise, from the Southwestern United States, is enhanced by the Zachary method, which hardens and slightly darkens the material without filling it with polymer, wax or dye. One way to tell natural turquoise from stabilized or enhanced turquoise is to drag your thumb over the material. If your thumb glides, it is natural; if your thumb drags, the turquoise has been stabilized. One exception is imitation turquoise, which is smooth, so your thumb may glide, but close observation of the ''matrix'' will reveal an almost painted-on look. Chalk turquoise is a form of natural turquoise that has a white chalk-like consistency. It has the same chemical composition as turquoise, only without the copper (it's the copper that causes the turquoise color). The chalk is then dyed and stabilized to produce a material that's hard enough to use in jewelry with a pleasing turquoise color. Turquoise is versatile in jewelry and combines beautifully with silver, gold and many gemstones. Because of this, it has earned an important place in the jewelry industry. Unwind chain and place around your neck. Measure the desired length of the necklace; add one extra inch and cut. Feed the chain through the hole of the largest donut and the optional large donut shape. Feed both ends of the chain through the sterling silver, filigree large-hole bead. Feed one end of the chain through the hole of a smaller donut, turn the donut over and feed the other end of the chain through the other side of the donut. Feed both ends of the chain through 3 small donuts and the sterling silver large hole bead with dots. Use 2 pairs of chain-nose pliers to open the jumpring. With the center of the ring facing you, move one end of the ring away from you while you hold the other end steady. Slip the end of the chain and one side of the toggle clasp onto the open ring and close. Repeat for the other side of the necklace. Cut 8 inches of Accu-Flex® professional-quality beading wire. Crimp a crimp bead onto the end of the wire. After crimping with both stations of the crimping pliers, give the crimp an extra squeeze with the chain-nose pliers to make sure the crimp is tight. Repeat this 2 more times, making a three-bead section. Add a crimp bead to the beading wire and crimp it, pulling on the wire so that the chain curves nicely around the beads. Make as many bead sections as you would like on both sides. Once you're happy with the bead sections, your necklace is complete. Congratulations!